Sophie Stargazer Boutique owner Kristin Snyder keeps an eye on where and how her boutique items are made. Kristin Snyder said she has always focused on eco-friendly, American-made fashion, but the owner of Sophie Stargazer Boutique LLC is becoming even more aware of where and how the items she sells are being made. 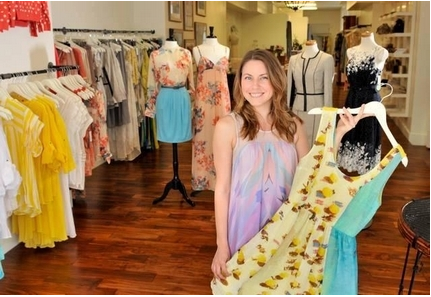 Snyder opened her women’s designer fashion boutique in 2013 on East King Street in downtown Lancaster. The store has recently started to integrate local brands whose origins match what she wants to see on the shelves. “I’ve brought in more ethically made brands and learned more about what that means,” Snyder said. The boutique carries many brands that are centered on helping groups of people – from shoe-makers in the Guatemalan slum of La Limonada to jewelry-making women who are escaping homelessness in Lancaster. In a roundabout way, the boutique is transitioning to what could be considered a social-enterprise business model by providing a place for established social enterprises to sell their products. A social enterprise is a business that aims to have some sort of positive social or environmental impact, or a for-profit or nonprofit business that uses the power of the marketplace to address social issues. Each year, ASSETS Lancaster and the Lancaster County Community Foundation host a business plan competition for social enterprise ideas. Applications for the 2016 Great Social Enterprise Pitch are due today (April 11). Snyder has applied. If her boutique is one of the 10 enterprises selected, she will go on to participate in weekly classes, have the opportunity to generate funding through public donations and participate in a live pitch event, where winners receive cash and pro bono services. Snyder shared a few reasons why she is interested in the Social Enterprise Pitch. Snyder’s business plan is changing. “I’m looking to add more ethically made brands, which obviously costs a little bit more,” Snyder said. Since this wasn’t part of her initial business plan, she needs to refine her model to reflect her additional mission. Snyder, who went to fashion school in Philadelphia, wrote her first business plan when she was in middle school. Since then, she’s worked with business mentoring programs such as SCORE, to help grow her boutique. Officials from the U.S. Small Business Administration visited her boutique in 2015 to encourage people to shop at women-owned businesses. Today, the boutique is carrying most of its ethically made pieces only on consignment, since it wasn’t in the original budget. On consignment means that the boutique allows the maker to sell the items there, and the boutique pays the maker once the item sells, instead of buying items in advance. Snyder’s goal is to get to a point that she can buy upfront from local artists so that they can produce more. She hopes that selling their products at her boutique will give them a platform for their own businesses to grow. Snyder grew up in Lancaster City, and although she left home to go to college in Philadelphia and also lived in Hawaii for three years, she cares about the community. She could have opened her shop in a larger city, but seeing all of the growth in Lancaster, she decided to stay. “I love being able to give back to the area that I grew up in,” Snyder said.